Any genuinely Australian experience must include time with the locals and a chance to experience the warmth of their hospitality, their ‘down to earth’ friendliness and that dry Aussie sense of humour. Situated at the foot of the Elder Range, Arkaba is possibly the most beautiful outback property in the country and operates as a 60,000-acre private nature conservancy. Arkaba offers an intimate experience of the Flinders Ranges and the chance to immerse yourself in a remarkable conservation story. Discover its rugged beauty and wondrous bird and wildlife from either the comfort of the historic homestead or on the three-night Arkaba Walk when you can swag out under the stars in style! GUIDES: your hosts, the incredibly knowledgeable and passionate Brendon and Kat, love sharing the bush with guests. For the more active, Arkaba offers some of the best bushwalking in the country; for the softer adventurers, an open top safari drive reveals the vistas and secrets of the property and is usually capped off with a sundowner drink with a spectacular panoramic view. For those who are keen to learn more about the challenges facing Australia’s native wildlife there is an opportunity to join the guides on a nocturnal ‘hunt’, tracking radio-collared feral cats or setting up the trip cameras that monitor key sites across the property. EAT: Arkaba has adopted a ‘buy local’ principle, and the head chef uses the very best of South Australia’s produce to craft the menu. A purely South Australian wine cellar has been selected to showcase a cross-section of wine-growing regions and the grape varieties for which they are best known. The bar is completely open and the chef will adapt what is on offer to suit guest tastes and needs. A wonderfully diverse destination with so much to offer. Self-drive is the most popular visitor transport of choice with good reason as the roads, with their knock-your-socks-off views every mile of the way, are for the most part in excellent condition and by and large devoid of other vehicles. Keep your eyes and ears open for a Tasmanian Tiger; the chances are that they are still out there! 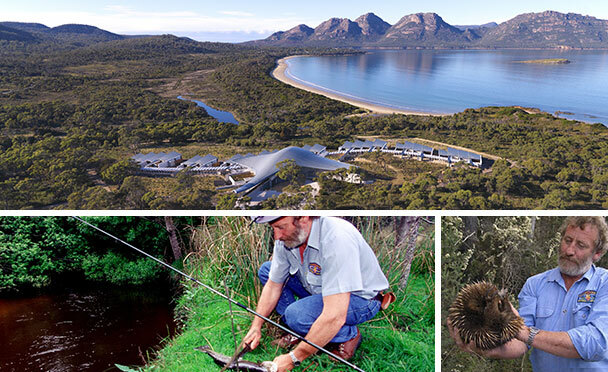 STAY AT SAFFIRE LODGE: super stylish, sleek and magnificently indulgent it still, in these incredibly beautiful and pristine surroundings, provides a chance to re-connect with nature. Their Tassie Devil enclosure provides a good opportunity to learn about the rare disease that has decimated this once common Tasmanian predator. GUIDE: Craig “Bushy” Williams. Never a city slicker, Craig was born in a small town in a remote corner of Tasmania and from a very early age felt at home in the bush. While more than capable of catching a trout, identifying an astonishing number of colourful bird species and finding hidden waterfalls, Craig’s real speciality is bush tucker. When touring with Craig, whether trekking Cradle Mountain, walking through pristine rainforests, dropping in at a local boutique winery or on the evening “Quoll Patrol”, you can be assured of savouring very good and very interesting bush tucker. Try Craig’s wallaby steaks with pepper-berry sauce, lemon myrtle-spiced local trout or fresh lobster complemented by a glass or two of fine Tasmanian wine. Craig’s love of good food, his sharp wit and his knowledge of the wilderness makes him one of Australia’s top guides. EAT: the farmers’ markets in Hobart – great places to graze your way through plentiful fresh seafood including some of the best oysters in the country, rounded off with sweet treats or artisan cheeses and washed down with a famous Tassie Pinot! ‘Pearl of the Pacific’ might sound a cliché, but this tiny island paradise rivals the beauty of Bora Bora and welcomes only four hundred guests at any one time. This is a place where you can swim with turtles before breakfast, hike through splendid exotic vegetation, indulge in a pampering spa treatment and BBQ fish on a white sand beach and where your mode of transport is a bike or golf buggy. This is the place to turn off your mobile phone, disconnect the WIFI and forget the world – and it is just a two-hour flight from Sydney. STAY: Capella Lodge is the place to stay. A nine-room lodge that oozes beach house chic! For the ultimate treat book the Lidgbird Pavilion – awe-inspiring inside and out, complete with private plunge pool and totally romantic. GUIDE: Jack Shick, another true local, takes guided walks up Mount Gower, standing tall at 875 metres. It is rated as one of Australia’s best day walks and is recommended only for the reasonably fit. EAT: Capella’s chef Peter Smit takes a regional approach to cuisine, using super fresh seafood, free-range eggs and vegetables gathered from around the island in every meal. For goodies that are not island-grown, Peter sources the best from New South Wales; he prides himself on being a true ‘locavore’ – well, as local as a Pacific island allows!